I thought I was buying a cryptokitty, and all I got was a picture of a dumb cat. Nobody can tell you what to buy on the internet. Purchasing frivolous luxury goods from Goop? Go for it. The Porg-from-Star-Wars mug in your Amazon shopping cart? Why the hell not. But there’s a new kitten on the block, and it’s got even the most prodigal internet-users shaking their heads. 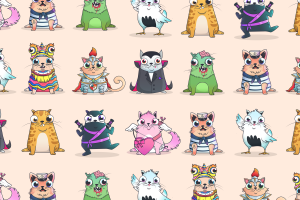 A blockchain-based game called Cryptokitties that launched last year just raised $12 million from investors. And how do you play it? In short, you give them your ether (the cryptocurrency based on the Ethereum blockchain) in return for little pictures of grumpy cats. A bit more detail: gamers can collect unique Kitties that have different Cattributes (patterns, eye shapes, highlights, etc. ), Mewtations (rare Cattributes), and an entire genealogy. The idea is to buy and “breed” kittens and sell them off for ether. Plus, your cash is safe with them, thanks to blockchain technology that puts each trans-cat-tion on a public ledger. Users can then “like” other kitties, and give their own obnoxious bios. “Oy. I’m Kitty #564551. My cousin twice removed is Genghis Khan. My secret indulgence is whiskies. This will be an amewsing friendship,” reads the bio for one particularly googly-eyed grey cat with yellow stripes. At the time of writing, prices for Cryptokitties range from the equivalent of $1.15 up to $58.4 million — a ludicrous amount for an ugly, virtual kitten. But before you wither under the fear of humanity’s imminent demise, you should know: the value of the cryptocurrency market makes just about as much (or little) sense as the value of any given Cryptokitty. Objectively, cryptocurrency is equally as valueless, and not nearly as visually interesting as a JPG of your ugly cat. After all, Bitcoin has value because we decided it does. It has no inherent value — you can’t build a house with it, or make it into jewelry. Scarcity and desirability alter that value. In the same way, there’s a limited supply of unique Cryptokitties (they are all guaranteed to be different from each other), each ascribed with an arbitrarily assigned value. The same is true for Beanie Babies and baseball cards. Besides, there’s nothing wrong with bringing blockchain technology closer to the cat-loving masses, as long as they are aware of what they are getting themselves into. As of right now, users are limited to selling and breeding, but Cryptokitties CEO Roham Gharegozlou is hoping to expand the Cryptokitty universe. “This is the early glimmers of what a blockchain-based game economy could look like,” Gharegozlou tells Business Insider. As long as you know the risks, get these Cryptokitties while they’re hot. Because unless you are, like, really, really good at Cryptokitties, they probably won’t be paying for your retirement.